First of all you will need to login or register a trading account. You can advertise as many activities, services and goods as you want. If you get stuck for ideas, think ‘outside the square’. E.g Think of some of the things you enjoy doing, or have done in the past. Ask yourself, how can they can be used to help somebody else? Have a look through the offerings of local and remote CES for ideas. Try to charge 100% Ecos. CES work best when all energy is valued equally by exchanging through use of Ecos. This includes the making of goods and professional services. Even if you have a business that needs to make $$ to cover costs, you can put aside time each week to trade with CES members. Naturally not all traders will be able to cover the costs of expensive materials paid for with $$. You are likely to find that there will be more demand for your offerings if you can keep the $$ costs to a minimum. Trading with 100% Ecos prevents the spiraling use of $$ in the system and maintains the spirit of CES and its’ principles, as supported by CES worldwide. People will only be able to connect with you through your offerings. Clearly describe what you would like to do. It helps to give some detail about what is involved and your skills and experience. If you find that people are no longer responding to your current offering, it may be time to offer something else, charge less, or check the Wants section. Prices are written like this ‘E20’ to mean ‘Ecos’ and like this ‘$20’ to indicate the ‘dollar’ component. When you enter the price in the Offerings window put the Eco amount in the Eco field without the ‘E’ symbol and the dollar amount in the dollar field without the ‘$’ symbol. 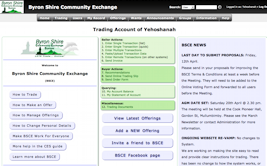 Telling other people what you would like out of the community exchange also helps to get trading happening. For instance, what would you like help with? Like to learn? What can you give as presents to friends and family (or yourself!). You can be as broad or specific as you like. It also helps the Administration get an idea of what businesses and skills we can work on joining up with the CES.